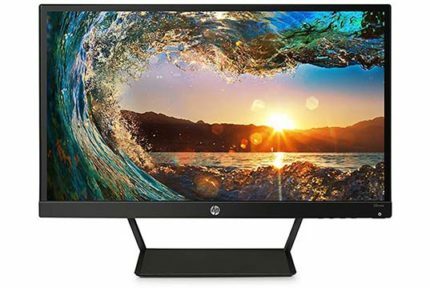 The HP VH240a is the perfect budget monitor if you need an affordable 24″ 1080p IPS display with a fully ergonomic stand. It’s great for work, everyday use, and casual gaming even though it lacks certain features which are available on similar budget models. 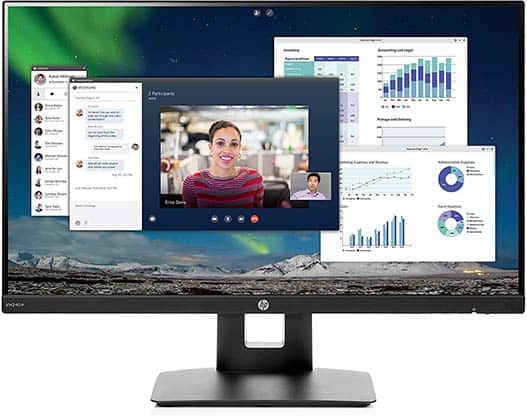 Based on an IPS panel, the HP VH240a monitor provides wide 178-degree viewing angles meaning that the picture won’t shift in color and contrast when you look at it from skewed angles. The monitor supports 8-bit color depth via dithering (6-bit + 2-bit FRC) for 16.7 million colors. However, it only covers 72% of the sRGB color gamut whereas similarly priced IPS models usually cover at least 96%. Now, the colors on the HP VH240a are still very rich and vibrant, but if you put it side by side with a ~100% sRGB IPS monitor, you will be able to notice the difference. So, we don’t recommend it if you do color-critical work; you can check out the best monitors for photo and video editing here. 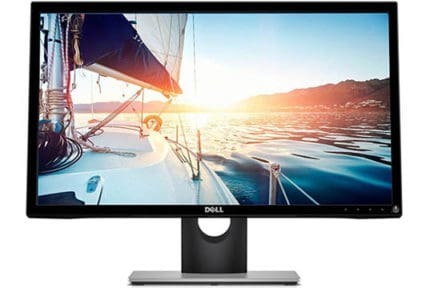 Other panel-related specs include a 250-nit peak brightness, a 1,000:1 static contrast ratio, and a 5ms (GtG) response time speed which is common for a display at this price range. You get a lower contrast ratio in comparison to VA panels, but you also get a faster response time speed, better viewing angles, and more accurate colors. In comparison to TN panels, you get significantly better color quality and viewing angles, equal contrast ratio, and a slightly slower response time speed. All in all, you get a well-balanced image quality and performance for the price. Full HD resolution (1920×1080) on a 23.8″ screen ensures plenty of screen space and sharp details thanks to the decent pixel density of 92 pixels per inch. It’s also not very demanding on your CPU/GPU. With a response time speed of 5ms and a refresh rate of 60Hz, you won’t get a mind-blowing gaming experience, but everything will run smoothly without any prominent trailing, motion blur, or other visual artifacts. The HP VH240a input lag performance amounts to ~11ms, so there won’t be any noticeable delays either. When you combine all this with the monitor’s crisp and vibrant image quality, you get a pretty decent gaming experience. Unfortunately, the monitor doesn’t support AMD FreeSync which would provide a variable refresh rate for compatible graphics cards that eliminates screen tearing and stuttering. The OSD (On-Screen Display) menu of the HP VH240a IPS display is fairly simple and user-friendly with only essential adjustments available. The hotkeys are placed at the right side on the back of the display and include the power button and four additional hotkeys for navigation through the menu. 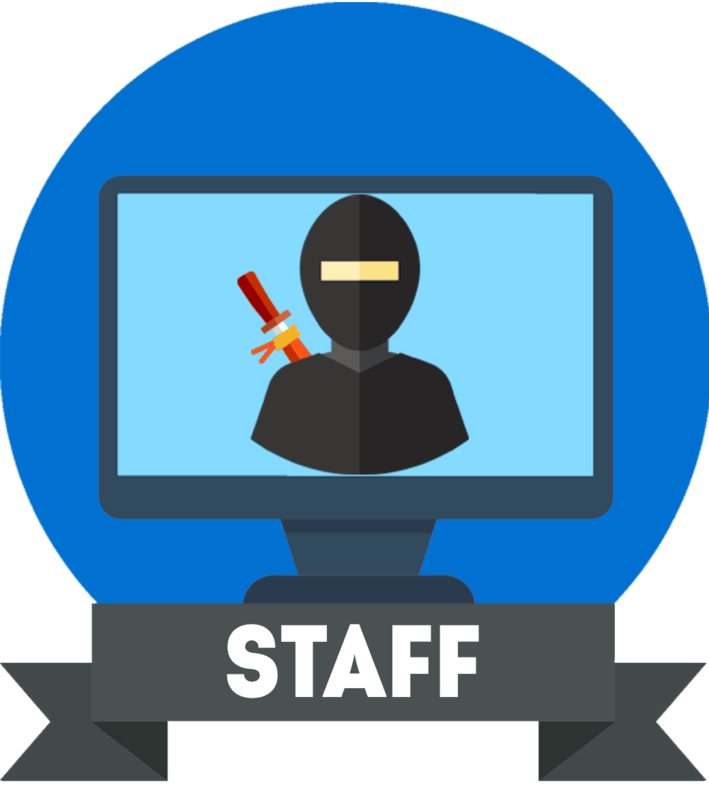 They can also be used as shortcuts for certain OSD functions. To start with, the first OSD button will allow you to quickly change the input source between VGA and HDMI while the one next to it opens up the Viewing Modes feature. These modes consist of three picture presets with reduced low-blue light emission suited for comfortable reading at night. Lastly, the third OSD button adjusts the audio level of the 2x2W built-in speakers. Other useful features include Auto-Sleep Mode which will send the monitor to Standby in order to preserve power when it’s been inactive for some time. 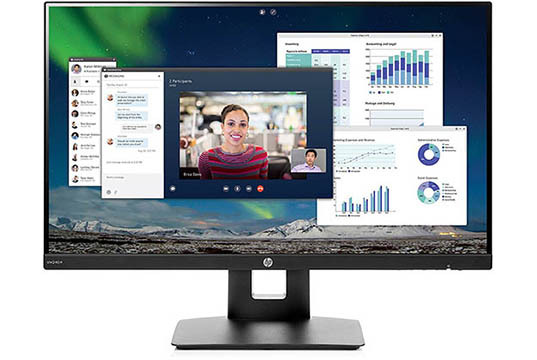 The HP VH240a 24″ monitor offers humble connectivity options with one HDMI 1.4 port and one VGA port available. There’s an audio jack for the built-in speakers, but no 3.5mm audio line-out port for headphones. There are no extra USB ports which is expected at this price range; what’s not expected, however, are such gorgeous thin bezels which deliver a cinematic viewing experience and make the display ideal for a multi-monitor setup. Furthermore, the monitor has an exceptionally versatile stand. You can elevate the screen up to 130mm, tilt it by -5°, 30°, swivel by 360°, pivot by 90°, and VESA mount it. The screen is also covered with an anti-glare coating which eliminates reflections. The HP VH240a price amounts to around $110 which is a fair price if you want an ergonomic stand and built-in speakers. However, for ~$20 more, you can get the LG 24MP59G. It has a tilt-only stand, but it supports AMD FreeSync up to 75Hz and has a DisplayPort port, so you can use FreeSync with compatible NVIDIA cards, too. Further, it offers 1ms Motion Blur Reduction and has a wider 99% sRGB color gamut. You may also want to consider the Acer SB220Q which is a 21.5″ 1080p IPS monitor with FreeSync up to 75Hz available under $100. It also covers 72% of the sRGB color gamut like the HP VH240a, but it has no ergonomic stand. 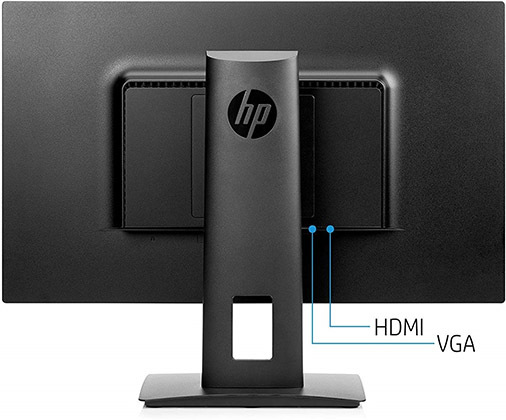 Overall, the HP VH240a is a great everyday monitor for the price. However, if you intend on playing a lot of video games or even doing some content creation, we recommend you save up for the LG 24MP59G instead whereas the HP VH240a is more suited for office-related use. The HP VH240a is the best budget monitor for office-related tasks. It has an ergonomic stand, built-in speakers, and a great image quality. However, for gaming and content creation, there are better alternatives out there.